This years NCECA in Portland. Oregon is looking to be the best one yet! Not only will my work be featured as part of the NCECA's Evocative Garden exhibition I will also be giving demos and discussing the use of live streaming social media as a way to share and promote your work. On Wednedsay March 2nd you will find me at the Speedball Art booth from 11 am- 1pm. Demonstrating my techniques, discussing my work and process and answers all of you burning questions. On Friday March 24th at 1pm I will be part of a panel presentation about using Periscope for Potters. There will also be a few yet to be announced casual meet ups! Follow me across all my social media channels for further updates. To celebrate the incoming new year, we have put together a list of 15 Potters to Watch in 2016. These are the potters who are making moves. Some are in graduate programs and taking huge strides, some are mid-career and working on exciting new projects, others are potters in the periphery who we think are on the edge of breakthrough. You will recognize some that we have covered before on cfile.daily, but most are new faces. We have included links and info about each potter and encourage you to explore their work further on their websites and on social media. Please remember that these artists are being presented equally, not in hierarchical order, because their radically different directions, goals, and aesthetics. We use the term “pottery” and “potter” extremely loosely. Some of these are sculptors that use pots as a conceptual element in their work, some are painters that use vessels as a canvas, and others are traditional functional studio potters. We have done our best to clarify each use of the terms in the descriptions of each artist’s work. The combination of a brilliant illustration skills, conceptual use of pottery, and modern themes have found Jessica Putnam Phillips huge art world success in 2015. Her work was recently a part of the exhibition “Art, and Other Tactics: Contemporary Craft by Artist Veterans” at the Craft and Folk Art Museum in Los Angeles, CA, one of nine exhibitions Putnam-Phillips participated in this year. This past fall she attended the prestigious residency program, A.I.R. Vallauris in the South of France, spending September and October creating a new series of work culminating in an international exhibition. 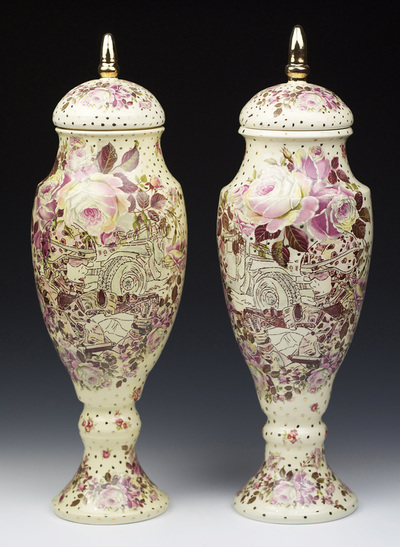 ​The long lasting association between ceramics and function is so engrained in our society we often instinctively connect the medium with particular utilitarian and domestic purposes, creating tension between fine art and craft. Dysfunction challenges this tension by asserting that functionality may depend upon context rather than an absolute and fixed purpose. This exhibition features work by ten contemporary artists who question the social, political, and economic forces that determine ‘proper’ function. Beginning with a playful pun as the exhibition’s title, Dysfunction initiates a dialogue about how our own assumptions concerning ceramics can be confronted through observing artwork that varies from beautiful and precious to surreal and grotesque. ​Artists: Shae Bishop, Charlie Cunningham, Bech Evans, Leslie Fry, Margaret Kinkeade, Julia Kunin, Roberto Lugo, Brooks Oliver, Jessica Putnam-Phillips, and Christopher Vaughn. Only a little more than one more week till the AIR Vallauris opening.! My time here in the French Riviera has flown by. In addition to being in this wonderful location I am honored to have had the opportunity to get to know and work with this group of talented artists! Exciting news for the upcoming year, I have been selected to present in NCECA's 2016 Process Room! Here is the official title and time for my presentation! I am looking forward to sharing my process and being part of NCECA 2016. See you all in Kansas City! I am so thrilled to announce that I have been selected to participate in the residency program for the 2015 season at A.I.R. Vallauris. Don’t let the dainty florals and smooth finish of Jessica Putnam- Phillips’sporcelain creations deceive you – hiding between the delicately rendered flora are female snipers in fatigues and combat helmets, armed and ready to shoot. The ceramics most often frame close up of females in active combat. Their eyes are fixed on a point in the middle distance while their poses reflect a tense readiness. Phillips uses her craft to bring to our attention some important messages about gender, combat, and the life of a female soldier on duty. “THROUGH THE EXPLORATION OF CERAMIC TABLEWARE AND NON-TRADITIONAL IMAGERY I SEEK TO CHALLENGE THE ENTRENCHED IDEAS OF DOMESTICITY AND GENDER ROLES WHILE EXPOSING THE SOCIAL AND CULTURAL ISSUES FACED BY MILITARY WOMEN” SAYS PHILLIPS IN HER ARTIST STATEMENT. Jessica claims that she wants to focus on the juxtaposition of serving at the dinner table and serving the nation, bringing to light social and cultural issues that female soldiers face within the highly masculine field of the military. The table-wear itself embodies this juxtaposition in its rendering. The florals are depicted in a style that is baroque and unapologetically abundant and colorful – while female soldiers, at the center of the pieces, although equally detailed, have a sketch-like quality and are rendered only using a dark ochre. The style seems to suggest that the experiences and memories of the battle field are incompatible with the expected performance of womanhood, and rectifying those things in one piece of art would be insincere. Still the compliment is in the contradiction, and it is the exactitude with which Phillips renders the portraits that compliments the florals. Phillips’s dinnerware ask us to re-contextualize what we understand to be feminine labor; and they connote the complex relationship that military women have with concepts of domesticity as they are continually asked to prove their competence and legitimacy in a male-dominated field. Phillip’s work is currently part of a group exhibit, “Art and Other Tactics: Contemporary Craft by Artist Veterans” at The Craft and Folk Art Museum in LA, which is open to the public until September 6th. Click here for more details. This comprehensive exhibition features artist veterans whose contemporary artworks critique the motives and aftermath of the wars in which they served, from Korea to the invasions of Iraq and Afghanistan. Artists include Jenn Hassin, Jesse Albrecht, Thomas Orr, Jessica Putnam-Phillips, Thomas Dang, and Ehren Tool among others. Curated by Emily Zaiden and organized in partnership with the Craft in America Study Center and the Museum of Craft and Design, San Francisco. America, The Beautiful, Onward & Upward II, and Secret Garden at The Clay Studio, Philadelphia. I am so excited to be showing my work with fellow Veteran Jesse Albrecht, here is a small blurb about our exhibtion. As an outgrowth of Jesse Albrecht and Ehren Tool’s “Occupation” of The Clay Studio’s Harrison Gallery during our 40-hour celebration, The Clay Studio continues our conversation about military service with an exhibition by Jesse Albrecht and Jesica Putnam-Phillips, who are both veterans of war. Each artist uses the ceramic vessel as both source material and canvas. 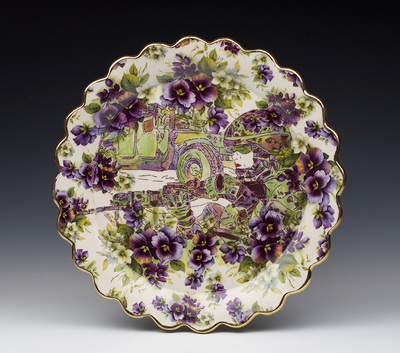 For Albrecht, early American folk pottery and crockery is a major point of reference. His rough-hewn forms perfectly compliment his raw, jagged drawings and texts. Conversely, the decorative European porcelain chargers and serving platters that Putnam-Phillips references work in opposition to her depictions of women in combat. Politics, material culture, gender and the realities of war infuse all of the work in this exhibition in different ways. For Albrecht, the word “crock” is a direct reference to his own feelings about his war experience as a medic in the Iraq war attached to the 101st Airborne Division. Putnam-Phillips’ work is much more positive on the surface—her platters show images of powerful-looking female soldiers in combat gear. The layers of commentary in her work involving “service” ware and its attendant cultural meanings are thorny and personal. My work has been selected to be part of Transformation 9: Contemporary works in Ceramics, the Elizabeth R. Raphael Founders Prize. This exhibition will be on view at the Society for Contemporary Crafts, Pittsburg PA, April 14-August 23 2014. After the exhibiton closes in Pittsburg it will begin a nation tour through April 2016. Two of my pieces; Semper Fi (lilac M4) and Convoy, Yellow Variant have been selected for the New England Collective Exhibition at Galatea Gallery in Boston. The show runs from Aug. 2-28th with the opening reception on Aug. 2nd 6-8 pm. 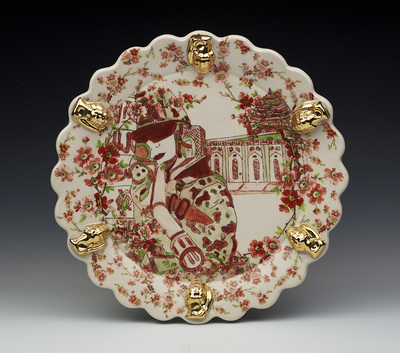 "Of the ceramics... Putnam-Phillips decorates her platters with unexpected imagery: contemporary female soldiers in uniform. The patterns and colors aren't out of place on china; but the imagery is unusual, meant as a surprise reveal should the plates ever be used. Putnam-Phillips brings her own experience as a former soldier (she served in Desert Storm) to realistic accuracy regarding attire and weaponry. The resulting works are meticulous yet upbeat, a window into the evolving world of women in the military. The pun of "server" and military service is intentional, playing with expectations of duty and domesticity".